You will be given a reference e-book to read which has 268 pages And the test will be based on that e-book , you can take final test within 1 year of purchase. Personal security refers to the process of achieving that state wherein appropriate and reasonable measures are taken to guarantee protection against diverse and adverse influences. It also refers to a general condition which takes place after taking adequate efforts that aim to delay, deter and offer warning before a crime is committed. This gives you the opportunity to instantly summon assistance once the warning is offered and constructively prepare yourself for the possibility of meeting a crime. Personal security is extremely beneficial because it works by effectively protecting people against physical violence, predatory adults and domestic abuse. It should also be noted that the personal security concept does not mainly cover protection against privacy invasion. It actually focuses more on protecting people from personal harm. When it comes to implementing personal security, there are a few guidelines that you need to follow. These include assessing the trustworthiness, behavior and capability of the people around you before you put your full trust on them. You can do this by performing background investigation, assessing their mental, physical and psychological qualifications and observing their behavior. You can also perform continuing and voluntary assessments and assess their capabilities by gathering information about their education and experience. Personal security can also be successfully implemented by making it a point to be part of a more secure environment, performing risk and vulnerability assessment and improving your awareness about security. It may also encompass the development of an effective emergency plan and system access control. One of the best things that you can do for yourself is to take part in the personal security certification program offered by Brainmeasures especially if you have longed to master everything which is associated to the implementation of the personal security process. This personal security course from Brainmeasures is one of its most useful online certification courses because it works in providing information about the basics of protecting yourself from harm. With the help of this online certification course, you will have an easier time accessing its personal security training which offers accurate information about the scope of the process, the most common principles associated to it, guidelines in developing the best personal security measures, the most common personal risks that you may encounter and the many techniques that you can use in protecting yourself from these harmful risks. 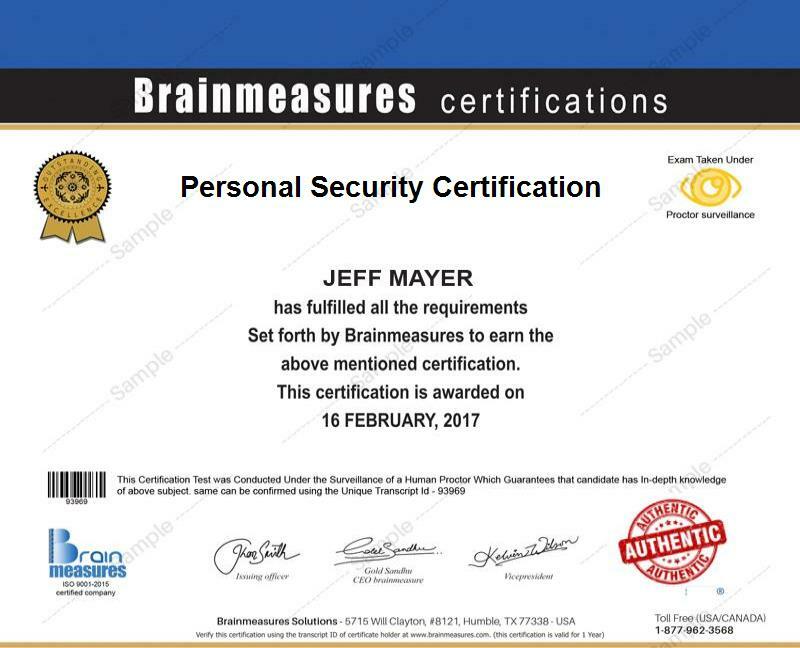 Earning your personal security certificate from Brainmeasures is proven to be really rewarding because it shows how effective you are in this certain field. How to effectively deal with bomb threats, bombings, hijacking and hostage scenarios? The personal security certification course offered by Brainmeasures is extremely useful for those who want to learn how to deal with all the threats, risks and harm when living in a hostile and insecure environment. It can work perfectly for you if you want to learn more about the different security measures that you can take in case your personal security is already breached. A higher level of salary can also be expected after you earn your personal security certification. You can actually start taking full advantage of your personal security certification by using it to get the position of a personal security consultant which allows you to earn around $38,000 to $65,000 annually. You can also work as a personal security specialist which can reward you with an annual salary of around $46,000 to $95,000.